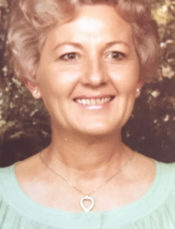 EDITH TOLAR WEBB JULY 12, 1932 – JANUARY 24, 2019 Edith Tolar Webb 86 of Pine Forest Community passed away Thursday January 24. 2019 at home surrounded by her family. She is survived by her husband of 69 years Adrian Webb, her daughters Shirley Anne Webb, Nancy Urquhart (Curtis), Susan Mather (Dennis) all of Pensacola. She is also survived by 7 grandchildren, 19 great grandchildren, 1 great great grandchild and numerous nieces, nephews and cousins. Edith was preceded in death by her parents, Wiliam A. and Ruby C. Tolar, her sister and brother in-law Genell (Fred) Young, her father in-law and mother in-law John L. and Lillie C. Webb. Edith Webb was a dedicated wife and mother. She and her husband were owners of Adrian’s Restaurant for many years, she was a Real estate Broker. For the past several years she enjoyed lunchtime spent with her husband and girls weekly. She was a member of Pine Forest United Methodist Church since 1944. She will be greatly missed. Edith’s Memorial Service will be held February 16th, 2019, at Pine Forest United Methodist Church on Wilde Lake Blvd. Visitation with the family will be held from 10:00 a.m. – 12:00 NOON, with the service being held immediately after. A special thanks to Covenant Care for the wonderful care they gave to Edith and her family. In lieu of flowers contributions may be made in her memory to Pine Forest United Methodist Church or Covenant Care Hospice of NW Florida. So sorry Rachel. What a sweet lady! My condolences to Adrian and family. I will always remember the good times we had playing cards on Saturdays with pot luck dinners. Edith was a very sweet lady. Love U Edith! I have so many wonderful memories of you & your family growing up! Love & Hugs to All! MY PRAYERS AND THOUGHTS ARE WITH YOU MR. ADRIAN !! ME MY PARENTS AND GRANDFATHER JOHN TAYLOR USED TO EAT AT THE RESTAUARANT ALMOST EVERY DAY WHEN IT WAS OPEN !! MOM DAD AND GRAMPS ARE ALL WITH MIS EDITH NOW . GOD BLESS YOU AND YOUR FAMILY SHE WAS A VERY SWEET LADY !